What is a mobile video game theater? It is a game truck trailer with FOUR wide screen high-def TVs cover the walls in front of custom stadium seats with built in vibration motors synced to the on screen action with speakers in front and back. Everything is linked together, so 16 players can play in the same game at once or up to 4 separate games at the same time! Play as a team or enjoy different games, because there are plenty to choose from! TWO MORE wide-screen high-def TV's are affixed outside the trailer...that's SIX GIANT HDTV's of video gaming fun! We have all the newest games from Wii, Wii U, Nintendo Switch, PlayStation 4, Xbox 360, and Xbox ONE with a "Game Coach" to help anyone who needs it. Since there are no single-player games, it's the ultimate party for any group to have fun together at birthday parties, events, festivals and more! The party that kids will talk about all year long? Forget the same old Pizza or Bowling Parties...with Rolling Video Games of Hilton Head and surrounding areas, your next birthday party will be the hit of the year! Be the first in your neighborhood to throw the best bash ever! This party comes to you...we set up, we clean up...you have fun! 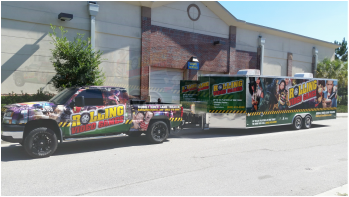 The hottest game truck on the road, Rolling Video Games is available for parties, events, fundraisers, school carnivals, corporate team building, festivals or anytime you want to thrill a group!